Another CicLAvia is in the books for me, my fifth one. It was a ride along Wilshire Boulevard starting in Downtown LA and going to Koreatown. I was actually considering not doing this ride because it was a partial repeat of a previous route I had already done, but then Doobie expressed interest in joining me and how could I resist that? The first Iconic Wilshire Boulevard ride in 2014 was quite the city adventure on wheels for me. This one turned out to be much more relaxing. I really enjoyed the experience and am so glad I took advantage of the event and that Doobie joined me. Now with the Metro Expo Line extended through our neighborhood, we had easy access to Downtown LA and we were at One Wilshire Hub in no time. Our biggest challenge was getting the bikes up from the underground station. We missed the elevator and Doobie had a little trouble holding on to his bike on the busy escalators. But it all worked out with the help of friendly and helpful fellow commuters. 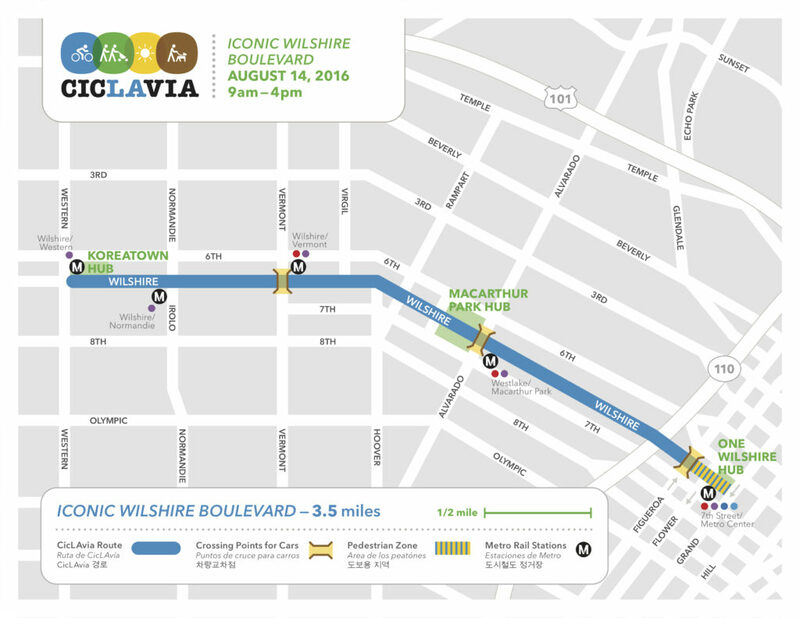 Since I had already done this route (although the 2014 version was about twice as long), I did not really have any particular plans, unlike CicLAvia: Heart of LA (2015) when I had a whole wishlist of places I wanted to see and visit. This time, I just wanted to enjoy and take advantage of the open streets (and hopefully find one geocache that was along the route, a new one since my last ride there). Doobie, however, had an agenda. He wanted to hunt Pokémon, stop at PokéStops and Gyms, and hatch eggs. I was totally okay with that. It would give me ample time to people watch and take in the whole atmosphere of the event. 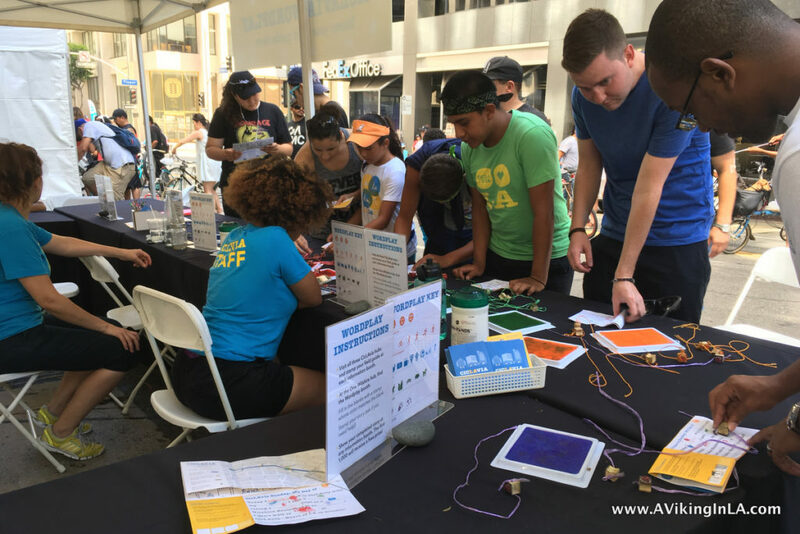 On their website, CicLAvia even had a list of the 56 PokéStops along the route with a reminder to be mindful and not to stop in the middle of the route. 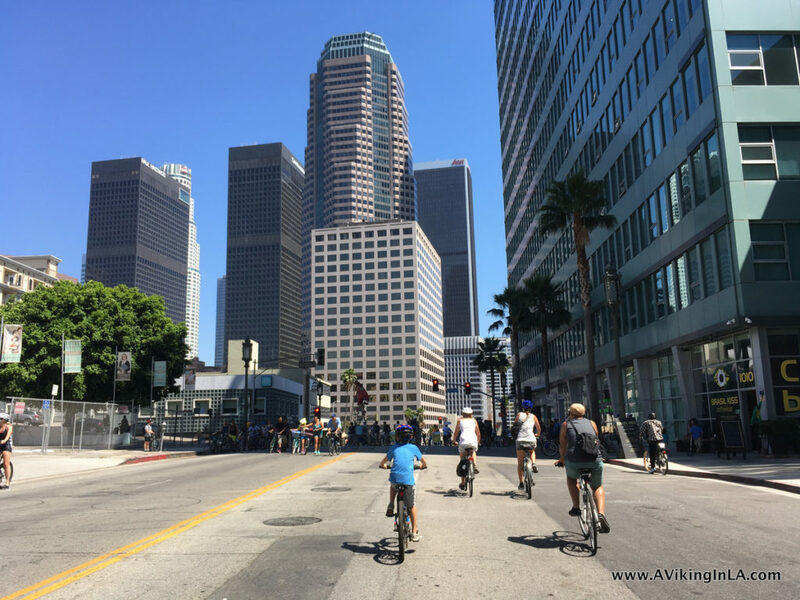 The big question for us was whether we should ride home on surface streets from Koreatown or retrace our steps back to One Wilshire Hub and take Metro Rail home. I think both routes would have taken about the same amount of time. The surface streets might even have taken less time (though we’d have to share the streets with cars). Doobie chose to return to Downtown and take Metro Rail home. 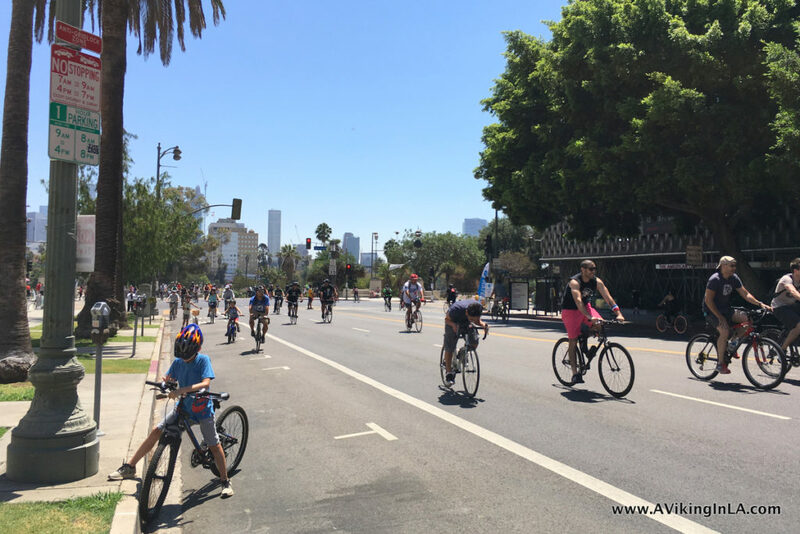 This actually allowed us to complete the CicLAvia Wordplay game. We weren’t aware of the game when we started and missed the first stop at One Wilshire Hub. 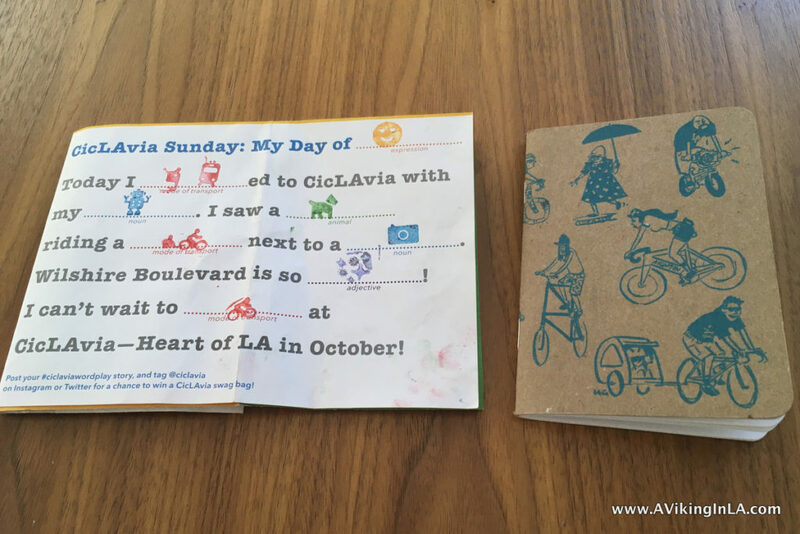 For the game, we had to visit all three CicLAvia hubs and stamp our field guide at each information booth. Then back at One Wilshire Hub, we had to complete a story using stamps before receiving a prize. I was surprised at how popular the Wordplay activity was with cyclers of all ages. Personally, though, I think the stories would have been more interesting if we could have entered our own words instead having to select from a few stamps, some of which didn’t even really work in the field they were supposed to go. I thought the prize of a choice of limited edition notebooks designed by local LA artists was cool, but Doobie was not impressed and did not think it worth the effort. This was the most laid back of all the CicLAvias I’ve done. It was a short route and less crowded than previous ones. There was no pressure to see lots of places. For me, it was just about enjoying the experience, checking out the area, and observing the other people participating. There are always interesting bikes and characters to admire and unexpected surprises to see along the route. The next CicLAvia is on Sunday, October 16, and it returns to its anniversary route in Downtown LA exploring the Heart of LA. I did it last fall with Sonny. We’ll see if our sports schedules allow me to do it again this fall. There was so much left unseen during that experience. 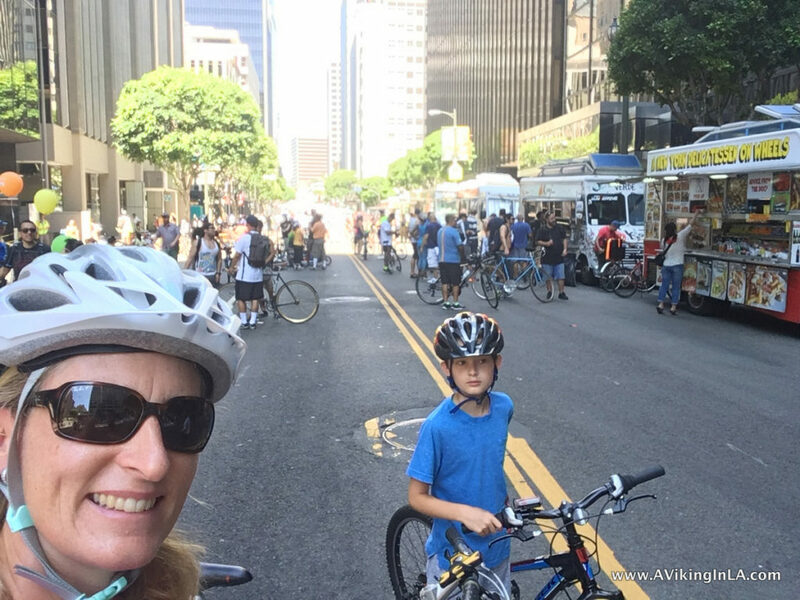 This entry was posted in Los Angeles & Environs and tagged biking, CicLAvia, DTLA, Expo Line, geocaching, Koreatown, MacArthur Park, Metro by Patricia Zanuck. Bookmark the permalink.